The R820T2 is the main tuner chip used in most RTL-SDR dongles. 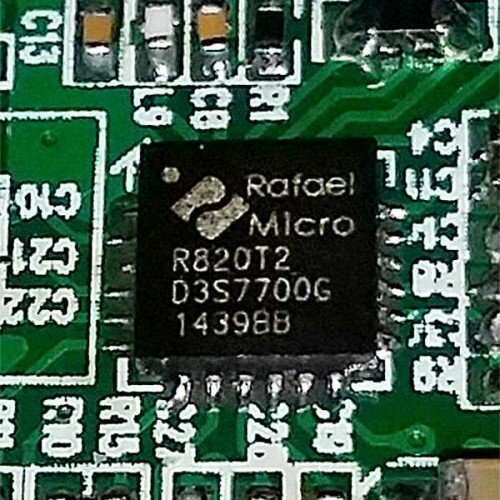 Several months ago Rafael Micro ceased regular production of their R820T2 chip, and the older R820T has also been discontinued for some time too. However, Rafael are still producing new quality R820T2 chips for factories if they make very large bulk orders. Since it is one Chinese manufacturer producing all of RTL-SDR.com V3, NooElec, FlightAware and most generically branded dongles, the volume restriction is not a problem for them as long as the RTL-SDR is still in demand. So most dongles using R820T2 RTL-SDRs should be able to continue business as usual for the forseeable future. But we have also recently seen that a lot of generically branded RTL-SDR dongles presumably produced at other factories have started to ship with the less desirable FC0012/13 tuner chips instead. The R820T chip is already 8 years old, and the R820T2 has been around for the last two years. The R820T2 was a slight improvement on the R820T, due to a higher quality manufacturing process used to produce it. The change in manufacturing process resulted in mostly higher yields, less chip-to-chip variance, better sensitivity, reduced L-band heat VCO lock issues, and wider filters. I have some bad news. Rafael Micro officially discontinued the R820T2 since a few months. This is the tuner we use in the Airspy R2 and Airspy Mini. We tried to secure an extra batch from Rafael (even at a higher price) but the quality of the silicon of the samples we received wasn't very good and most units didn't pass our automated QA tests. Sacrificing the performance is out of question. The alternatives proposed by Rafael are not pin compatible and require both a significant hardware redesign and new tuner control code - and this is a large investment with very little guarantees on the final result. I can say this has been one of the longest running designs that resisted the new silicon tuner SDR's popping in and out while setting a standard for performance and price. For now, our distributors are running out of R2/Mini's very quickly and, until a final solution is found or a new replacement is designed, there won't be any new batches out. I was checking my notes for alternatives to the current Airspy R2/Mini design and wondered if consulting the community would give some constructive input. As the market is already crowded with low cost receivers and transceivers, but yet Icom manages to sell a 4 figures SDR, I was thinking of making something that is as open as possible for extensions and work good enough for the most demanding operators and pro's, all while being affordable. The idea is to replace the R820T2 tuner with one of its latest high performance siblings, then replace the old LPC4370 with the brand new i.MX RT1020. 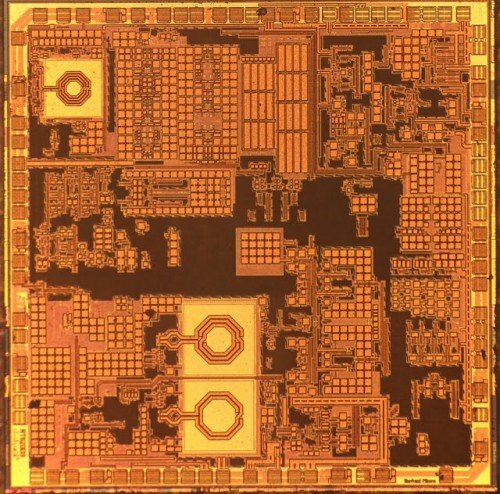 This MCU can be interfaced with a good ADC and has enough processing power for oversampling and decimation through the Cortex M7 core, which will bring the final resolution higher. UPDATE (May/2018): The Airspy team have managed to acquire a new batch of good R820T2 chips, so production of the R820T2 based Airspies can continue as per usual. So in conclusion there is no need to panic buy R820T2 RTL-SDRs as production will continue as per normal for the forseeable future as the RTL-SDR demand is high enough for factories to make large bulk orders of new R820T2 chips. Even if the R820T2 is fully discontinued, there are alternative tuners with the same performance that we can switch to after a minor redesign. Note that we're currently out of stock of RTL-SDR V3's on Amazon and low in stock on our store but this is not related to R820T2, but rather simply shipping delays. We should be fully back in stock within a few weeks. Over on YouTube the electronupdate channel has posted a video showing the decapping of the R820T and RTL2832U chips. Decapping is the process of removing the plastic packaging on integrated circuit chips, thus exposing the internal circuits printed on the silicon die for viewing. In the video he shows microscope images of each of the decapped chips and explains a bit about what each part of the chip does. Over on his blog he’s also posted the full decapped images of the R820T and RTL2832U for viewing. The decapped R820T tuner die. 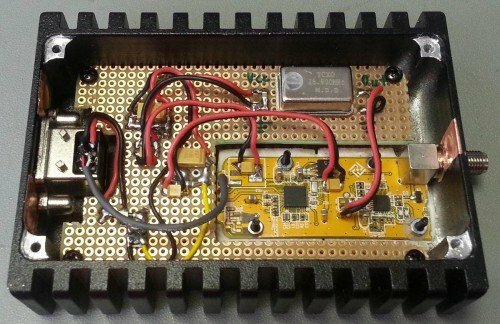 Recently Luigi Tarenga wanted to do some work on developing RTL-SDR drivers, so he emailed Rafael Micro requesting some additional documentation about the chip. Usually previous requests to Rafael Micro for such information seem to have gone unanswered, but this time it seems they have decided to publicly released the Register description document for the R820T2 chip. Previously the R820T datasheet was leaked/released to the public, but the information in the datasheet did not help much with driver development. 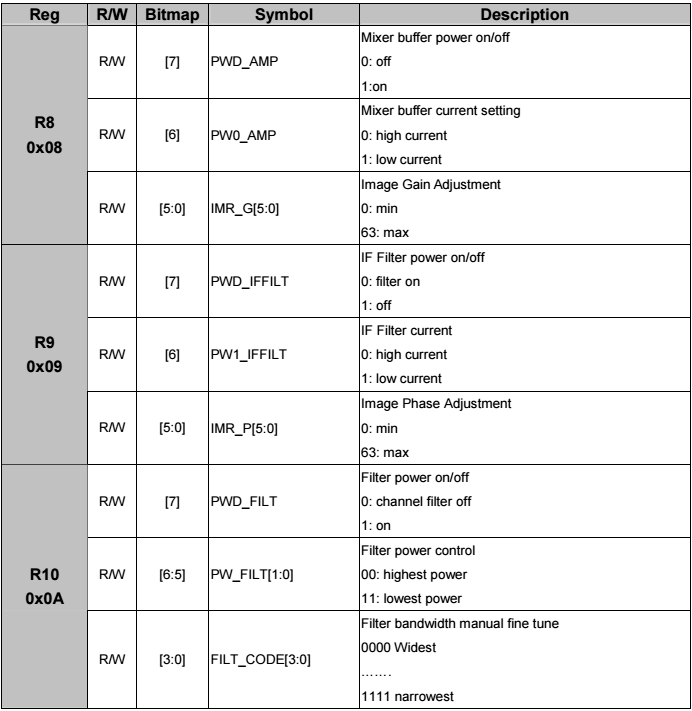 This register description document describes the function and configuration bits for the registers on the chip, and may be useful for people wanting to develop better drivers for the RTL-SDR. We have uploaded a copy on our server here. Description of some of the registers in the R820T2 chip. Over on YouTube RTL-SDR experimenter Adam 9A4QV has uploaded a video showing how the R820T dongle can fail to receive properly at frequencies above about 1.4 GHz as the temperature in the dongle rises. This is a known problem that may cause issues when trying to receive satellite signals like Inmarsat at 1.541450 GHz. In our own tests, the R820T2 chip appears to be much less prone to this behaviour when compared with the R820T, but still fails if the ambient temperature gets too hot, for example if left in direct sunlight. We’ve had several R820T2 RTL-SDR’s running at 1.5 GHz+ for over 48 hours when left in the shade, but not one R820T ran for more than a few minutes at those frequencies. Of course the E4000 tuner is the best RTL-SDR tuner for these GHz level frequencies, but that tuner is now rare and expensive. Over on Reddit, some people have been discussing this issue, and have proposed that the likely cause is related to the PLL failing to lock properly at higher temperatures. A fix may be to apply a blob of solder to the vias underneath the R820T chip, and then attach a heatsink. The problem also does not occur on the Airspy, a higher performance SDR that also uses the R820T2 chip in its design. This may be due to better drivers for the Airspy, or better heat dissipation in the Airspy’s hardware design. Amateur Radio astronomer Peter Kalberla recently wrote in to let us know about a paper he has written exploring stability issues and comparing the R820T and R820T2 RTL-SDR tuner chips (pdf warning). The R820T2 tuner is an upgrade to the R820T tuner which is used in the most commonly found RTL-SDR dongles. 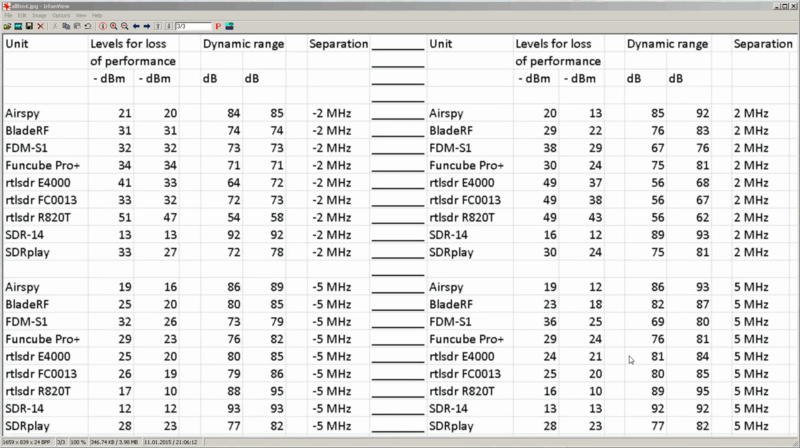 Peters first results show that the R820T2 has better reception and less spurious features at frequencies above about 1.45 GHz and improved frequency stability (with the newer R820T2 dongles that use the SMD oscillator). His second set of results explore issues that are more closely relevant to radio astronomy including observed spectra, Allan variance (frequency stability) tests and determining the shape of the R820T/2 internal bandpass filter. Two Newsky RTL2838U dongles were tested, the R820T2 device against the R820T. The evaluation results in a clear preference for the new RTL2838U/R820T2 dongle. In the L-band the new dongle is at least 2.7 dB more sensitive. According to the radiometer equation the effective system temperature is reduced by almost 50%. Most important for reliable radio astronomical observations are stability issues. Allan variance tests have shown that the R820T2 dongle is far better then the older version. The stability is comparable to that of professional radio astronomical devices. The tests have shown that using the full bandwidth of the RTL-SDR devices results in spurious baseline ripples. For a good performance it is recommended to use the dongles at reduced bandwidth. rtl power with the crop option -c 0.5 appears to be a good choice. As seen in this previous post, the R820T tuner chip used on most RTL-SDR’s has a built in hardware tunable IF filter. 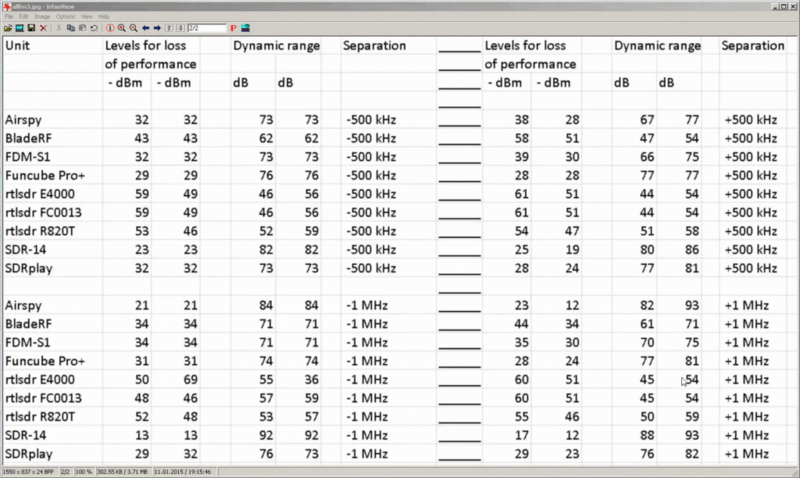 Leif, the programmer of the Linrad SDR software has been experimenting with this filter and has uploaded a video of his experiments to YouTube. In the video he shows how the R820T IF filter can be set to be as narrow as 300 kHz. Using a narrow IF filter can help to reduce the interference from strong nearby stations by up to 30 dB. Leif uses a modified RTL-SDR driver that comes with Linrad which allows the IF filter to be manually modified. Update: Leif has posted some extra details in the Osmocom mailing list. He writes that the modified driver can be found at https://github.com/dl8aau/librtlsdr and a Windows version is at https://drive.google.com/file/d/0B9m6SAaGpewQeWtyS0lzdW1xVmM/view?usp=sharing. Addition of 100nF, 1nF and 100pF bypass capacitors on the power supply rail. Added a common mode choke to the 5V line. Added a MuRata NFM21 EMI suppression filter to the 5V line. Replaced the oscillator with a 0.3 ppm temperature controlled oscillator (TCXO). Disabled the internal RTL2832U 1.2V switching supply and provided external 3.3V and 1.2V supplies. Replaced the MCX connector with an SMA female connector. Enclosed circuit in a metal box. In addition to the mods, Laidukas also made some measurements on the performance of the R820T2 on some metrics. In the first test he measured the input insertion loss or SWR. 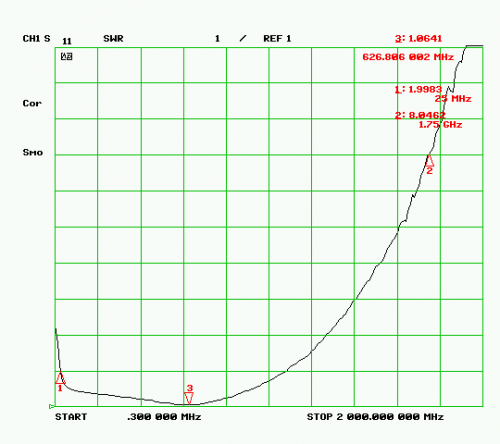 He found that the SWR was below 2 between frequencies of 25 MHz to 1076 MHz. 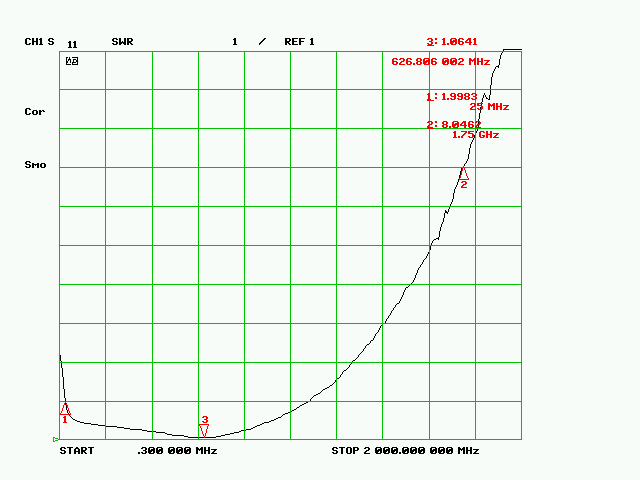 At higher frequencies the SWR reached levels up to about 8. 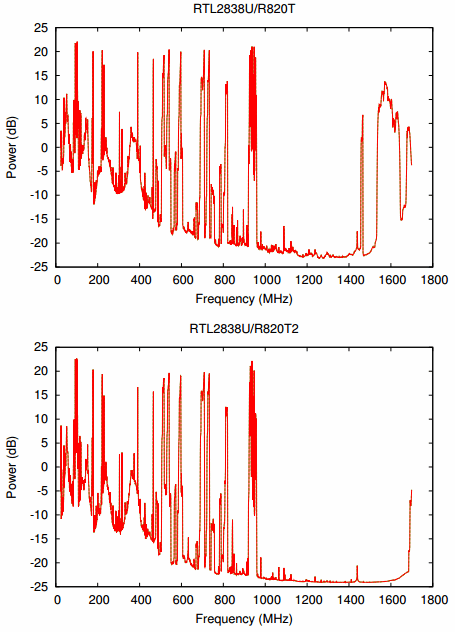 Another test showed that with the LNA disabled the R820T2 had a lower noise floor by about 7dB, when compared to the R820T.